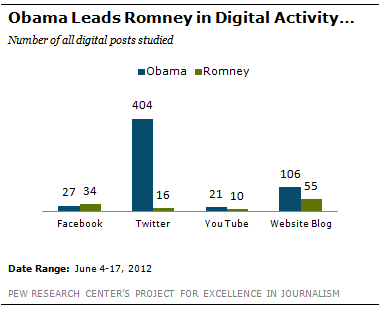 A new Pew Project for Excellence in Journalism study of how the campaigns are using digital tools to talk directly with voters finds that the Obama campaign posted nearly four times as much content as the Romney campaign and was active on nearly twice as many platforms. More than ever before, voters expect to be given an opportunity to express themselves and interact with information by sharing with friends, posting to Facebook, tweeting and commenting on posts. Candidates must effectively engage the social sphere from the outset of their campaign to remain competitive in this election cycle. Voters of all ages and persuasions are increasingly turning to social media for information about political issues and candidates. According to a May 2011 study conducted by digital agency SocialVibe, 94 percent of social media users of voting age engaged by a political message read or watched the entire message, and 39 percent of these people went on to share it with an average of 130 friends online. 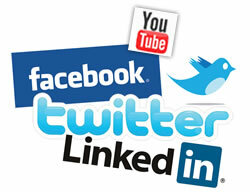 Social Media Engagement Will Decide Election 2012. "Disruptive Innovation" can change the rules of the game! Without Barack Obama's disruptive innovation in using the Internet to drive and support his 2008 campaign, he probably would not have won in the primary race against Hillary Clinton. If presidential campaigns are in part contests over which candidate masters disruptive innovation in campaign strategies, Barack Obama holds a substantial lead over challenger Mitt Romney. President Obama, for example, has 18.5 million Twitter followers verses Mitt Romney's 840,300 followers ~ and some suspect Romney has purchased a certain number of fake Twitter followers. Obama's digital content also engendered more response from the public-twice the number of shares, views and comments of his posts. Just as John McCain's campaign did four years ago, Romney's campaign has taken steps over the summer to close the digital gap-and now with the announcement of the Romney-Ryan ticket made via the Romney campaign app may take more. The Obama campaign, in turn, has tried to adapt by recently redesigning its website. These are among the findings of a detailed study of the websites of the two campaigns as well as their postings on Facebook, Twitter and YouTube-and the public reaction to that content-conducted by the Pew Research Center's Project for Excellence in Journalism. In theory, digital technology allows leaders to engage in a new level of "conversation" with voters, transforming campaigning into something more dynamic, more of a dialogue, than it was in the 20th century. For the most part, however, the presidential candidates are using their direct messaging mainly as a way to push their messages out. 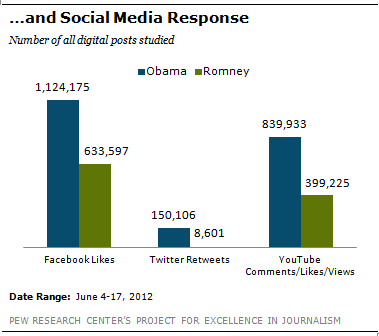 Citizen content was only minimally present on Romney's digital channels. The Obama campaign made more substantial use of citizen voices-but only in one area: the "news blog" on its website where that content could be completely controlled. The study of the direct messaging of the candidates also reveals something about the arguments the two sides are using to win voters. Romney's campaign was twice as likely to talk about Obama (about a third of his content) as the president was to talk about his challenger (14% of his content). That began to change some in late July when the Obama campaign revamped its website. 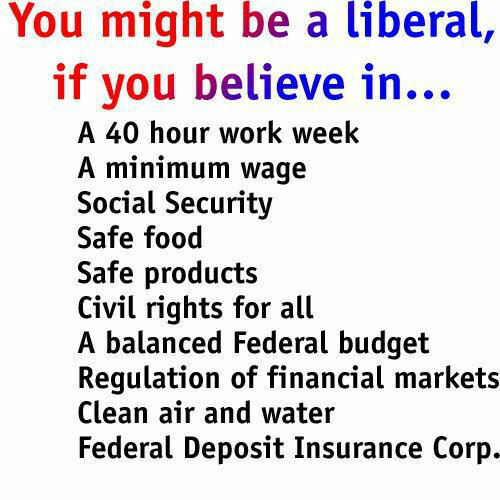 And while the troubled economy was the No. 1 issue in both candidates' digital messaging, the two camps talk about that issue in distinctly different ways. Romney's discussion focuses on jobs. Obama's discussion of the economy is partly philosophical, a discourse on the importance of the middle class and competing visions for the future. This is the fourth presidential election cycle in which the Project for Excellence in Journalism has analyzed digital campaign communications. This year, in addition to the campaign websites, PEJ broadened its analysis to include an in-depth examination of content posted on Facebook, Twitter and YouTube, areas that were either in their infancy or that candidates made no use of four years ago. The study encompassed an examination of the direct messaging from the campaigns for 14 days during the summer, from June 4 to June 17, 2012, a period in which the two campaigns together published a total of 782 posts. The study also included audits of the candidates' websites in June and again in late July. The Romney website, by contrast, contains a page dedicated to accounts about the candidate from the mainstream news media, albeit only those speaking positively of Romney or negatively of Obama. Read the full study @ Project for Excellence in Journalism. Tea party-backed attorney Ted Cruz trounced old guard Republican Lt. Gov. David Dewhurst to win the July 31 primary runoff and seize the GOP nomination for the U.S. Senate. In toppling Texas Lieutenant Governor David Dewhurst for the state’s Republican nomination for U.S. Senate, Mr. Cruz certainly had the full force of the Tea Party movement supporting him with cash, social media, and people power. Dewhurst had more than a 2-1 advantage in campaign spending, used largely for old media advertising buys. And still, Tea Party favorite Cruz shellacked Dewhurst 55 percent to 45 percent. What happened to the old math of campaign spending in the 2012 Texas GOP primary? Tea Party groups and Ted Cruz both know how to use the Internet's free communication channels to connect with voters and get out the vote. Politico: For all the hype surrounding social media in campaigns, Cruz is another example of a dark horse candidate who applied disruptive innovation in the way his campaign tapping into the vast power of Facebook, Twitter, blogs and email. "It was like watching a tree grow," said Dave Jennings, a Houston-based Dewhurst backer who blogs at BigJollyPolitics.com. "You could see it work. I don't know who was the arbiter of all those decisions, but the social media — the Facebook, all those Drudge ads, all of it — was brilliant." Among Cruz’s smart cyber moves: Weekly calls with supportive bloggers, who had access to the candidate throughout the race. Two full-time staffers focused on social media content, resulting in speedy responses to just about every tweet, Facebook comment and email. A microsite, cruzcrew.org, that empowered volunteers to take on tasks and print out campaign literature. The use of social media ads from the earliest days of the campaign to build a mailing list that is, in the words of Vincent Harris, the Cruz campaign digital strategist, "bigger than most of the failed Republican candidates for president." Cruz’s team did what they could to make their Web following feel empowered. The bumper sticker art, for instance, was picked via an online poll. Read the full article @ Politico. On the Democratic team, Texas State Senator Kirk Watson (@kirkpwatson) knows how to effectively use Twitter and other social media to open and maintain discussions with his constituents. Sen. Watson writes his own blog/e-newsletter the Watson Wire, and has a large following on both his political and personal Facebook pages. His website – www.kirkwatson.com – is plugged into his Facebook and Twitter pages and he recently started experimenting with a comment function where, if people log in, they can leave their thoughts and questions, to which Senator Watson can respond. Senator Watson uses social media to inform his constituents about issues and have regular two-way conversations with large numbers of voters at one time. Senator Wendy Davis also knows how to effectively use social media to drive and support her campaign against Mark Shelton. Hat tip to texasmonitor.com for the Texas social media statistics. 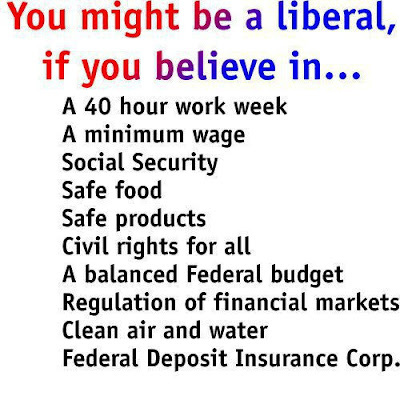 Democrats - Wake Up And Learn To Use The Internet!